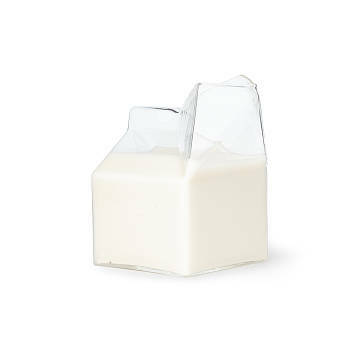 Serve milk, cream, and some playful high school nostalgia in this durable glass milk carton. A playful rendition of the classic mini milk carton, this glass creamer provides a nostalgic trip back to your high school cafeteria—minus the hormones working overtime on a dozen crushes at once. Made of durable chem lab beaker glass, it can go into the microwave, if you like your creamer heated. An A+ container for candy, nuts, or a few small blossoms, it also makes a fun gift for a hostess, or an old high school pal. Made in China.